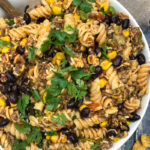 Everything you love about tacos and pasta salad tossed in this delicious Loaded Taco Pasta Salad! This tasty salad is perfect for a picnic or a potluck! 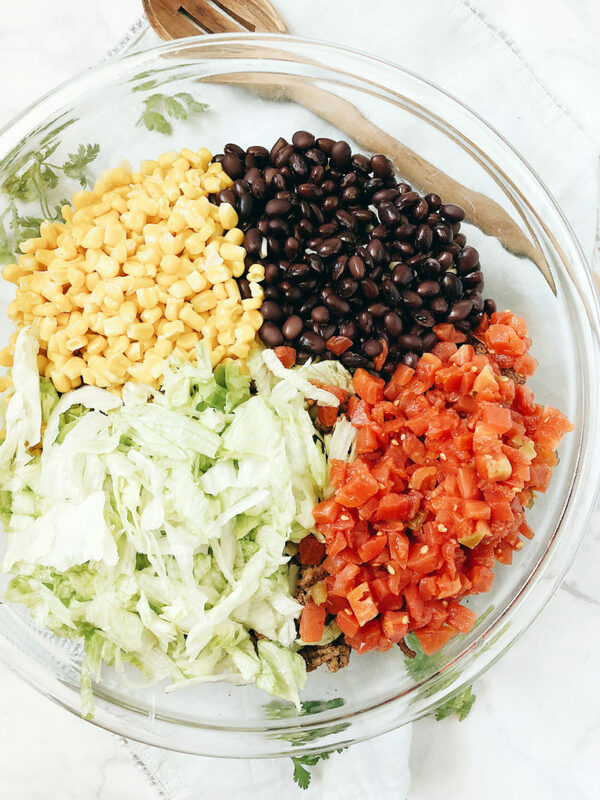 I am crazy about this Loaded Taco Pasta Salad! I mean what’s not to love about it? 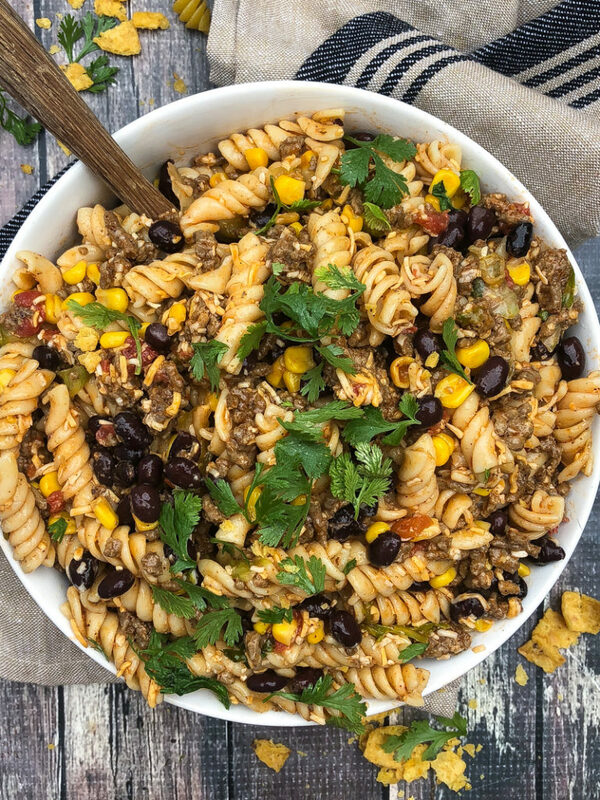 Pasta tossed with ground beef, shredded lettuce, cheese, corn, black beans, diced tomatoes and crushed corn chips tossed in a creamy French dressing. It’s total yumminess in every bite! 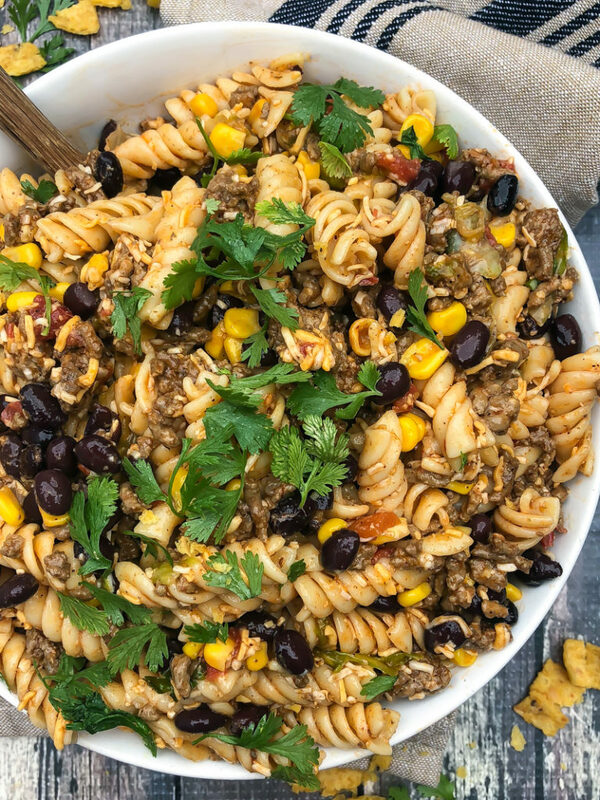 It’s picnic season and this easy and tasty Loaded Taco Pasta Salad is perfect for any BBQ, party, or potluck! Even if I don’t have a picnic to go to I always whip up some sort of pasta salad to have in the refrigerator for the week. When I make this one it never lasts very long. Mr. Mother Thyme loves it! 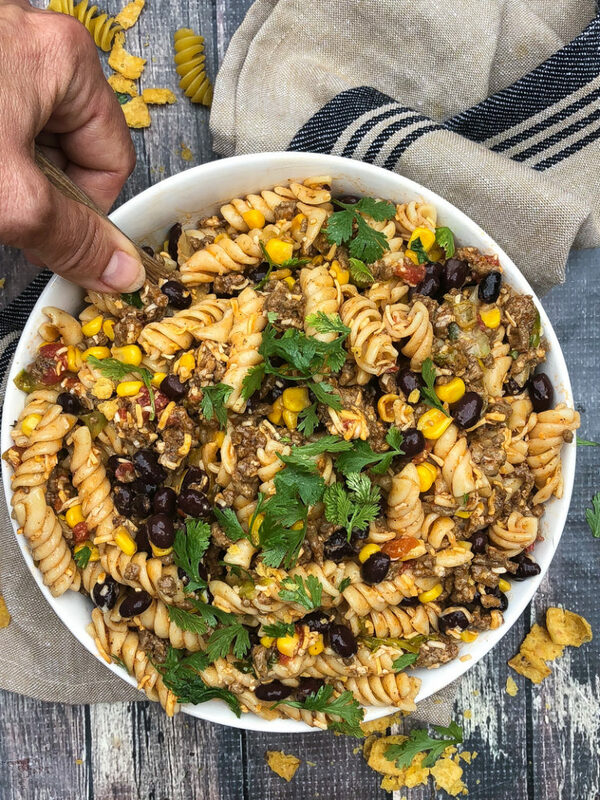 If you’re a fan of my One-Pot Cheesy Taco Pasta then you’re going to love taco pasta salad that yes is served cold. Trust me, it’s sooo good! If you’re looking to whip up something new for your next cookout then you’re going to want to try this. Everything you love about tacos and pasta salad tossed in a delicious Loaded Taco Pasta Salad! This tasty salad is perfect for a picnic or a potluck! Drain and rinse under cold water. Set aside. While pasta is cooking add ground beef along with chili powder, garlic powder, cumin, oregano, paprika, salt and pepper to a large skillet that has been preheating over medium heat. Cook ground beef, stirring to break up chunks until cooked throughly. Drain and excess grease. And set ground beef mixture aside to cool slightly before adding to pasta. Place pasta in a large bowl along with ground beef mixture, lettuce, cheese, diced tomatoes and chilis, and black beans. You can also add in some chopped cilantro and green onion too. That's totally optional. Add 1 cup of dressing and toss to coat. Add an additional 1/2-1 cup dressing if needed, reserving at least 1/2 cup to toss right before serving. Chill pasta salad in the refrigerator for a few hours or overnight. Before serving mix in crushed corn chips and add additional dressing if needed. Season with additional salt and pepper to taste.